Warwick China Company enjoyed a long history – over sixty years producing decorative pieces, fine dinnerware and finally, vitrified china. According to their catalog ca. 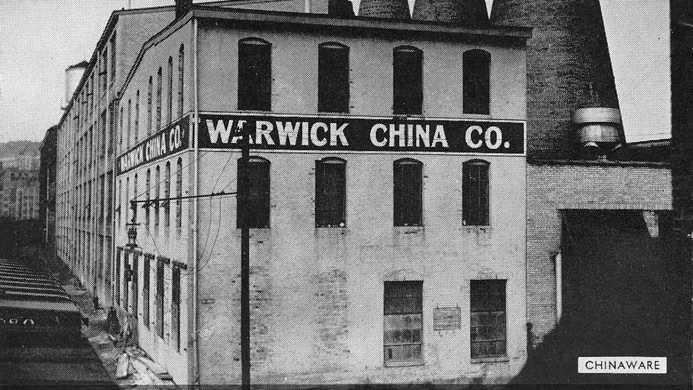 1940s, they produced “Vitrified China for Hotels, Clubs, Restaurants, Institutions, Steamships, Railroads, and Hospitals.” No doubt, their entry into china production for commercial accounts was one way in which the Warwick China Company hoped to keep the kilns firing and so many residents of Wheeling employed. After all, Wheeling was one of the great manufacturing centers in the nineteenth century. Sadly, this manufacturer closed in doors in 1951. Warwick had produced some of the most beautiful china – highly decorated and complex pieces. They were one of the few American potteries to attempt the manufacture of flow blue. Their expertise was well known in the pottery world. Wheeling of course possessed all of the natural assets necessary to produce, market and ship wares. The chamber of commerce of Wheeling announced that Wheeling was at the crossroads for manufacturing and shipping. Most American pottery was manufactured in the Ohio Valley along the mighty Ohio River. And as a consequence, Wheeling certainly played an important part in the history of Ohio River Pottery.